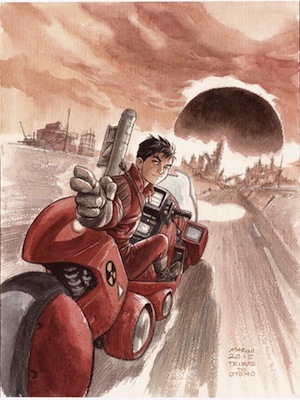 Based on this preview when they say “Otomo,” they mean just Akira apparently. But that doesn’t make the work any less cool. Carl and Andrew choose their words carefully when the describe Aquarion Logos. Mary Seacole does her best to comfort the English troops during the Crimean War. Her good deeds would be both rewarded and forgotten in equal measure. A spotlight on the works of Tohru Fujisawa. He is much more than GTO. But you should also read all of GTO. That includes Shonan Junai Gumi!, GTO: Shonan 14 Days, GTO: Paradise Lost. Oh and Ino Head Gargoyle, GT-R, and Bad Company. Yeah. Just read everything he does. After another hiatus the OSMCast is back and talking about Fantasy XIV: Heavensward. They also talk about Fate/Grand Order which is far more important. Information Density allows a developer to say far more with far less. The example given is from the TV show Mr. Robot but can be used as an example for all creative endeavors. One of my favorites from the exhibit preview. Decide Our Fate: What Should We Rewatch Next?